Discharging Debts from a Divorce - Can You Discharge Them? To write off debts owed to your ex-spouse from your divorce you need to meet two conditions: 1) the debts must be about marital property or debt, and not about support; and 2) you must file a Chapter 13 case, not Chapter 7. There's a myth that in bankruptcy you can't ever write off obligations to your ex-spouse that are based on your divorce. This myth comes from the fact that much of the time you can't. 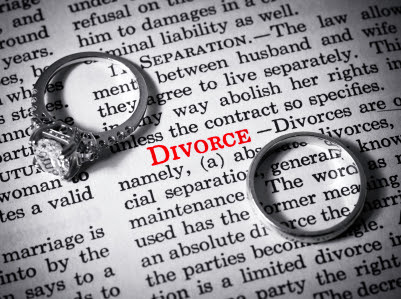 You can't discharge any kind of divorce-based obligation owed to your ex-spouse under Chapter 7. And you can't discharge child and spousal support under either Chapter 7 or 13. But as stated in the first paragraph above, that still means that NON-SUPPORT obligations CAN be discharged, and only under Chapter 13. Chapter 7 is "straight bankruptcy," and Chapter 13 is a payment plan, so why would it help to file under Chapter 13? What's the benefit of a discharge of the non-support obligations if it's part of a payment plan? Because the reality is that under Chapter 13 some creditors are often not paid much, and sometimes are paid nothing. Many factors determine how much, if anything, would be paid to an ex-spouse in any particular case. Often you can pay certain other debts in full, such as income taxes or a car loan, with little or no money going to your ex-spouse and the rest of your creditors. But again this only applies to non-support financial obligations. So what do those include? These include all parts of the divorce which require you to pay money to or on behalf of your ex-spouse-other than child or spousal support. These obligations are related to how the assets and/or the debts of the marriage are divided up in the divorce. On the asset-division side, these are usually obligations to pay a certain amount of money to equalize the division of assets. For example, if one ex-spouse gets the vehicle which has more value or equity, he or she would likely be required to pay a certain amount to the other to make up the difference. On the debt-division side, these are usually obligations for one ex-spouse to pay all of a joint marital debt, or all or part of the other's debt. For example, one spouse may be required to pay all of one joint credit card debt for having used that card solely for his or her benefit without the other spouse's knowledge. So these kinds of non-support debts can be written off in Chapter 13. Consequently that's an option you should consider if you have a substantial amount of this kind of debt. But to get clearer understanding how this works, let's look at three other important considerations. 1) To write off this kind of debt, it must not be "in the nature of" support, even if it is not given that label. The bankruptcy court has the power to consider whether an obligation is actually "in the nature of" child or spousal support regardless what it's called in the separation or divorce documents. For example, an obligation to pay ongoing medical expenses may be treated as support, especially if the monthly support payment is reduced because of it. So when you come in to meet with us bring your separation or divorce documents for us to review this issue. 2) Inform us about your arrangements with your ex-spouse about these obligations. Unlike regular creditors who usually don't take it personally when you discharge your debts in bankruptcy, your ex-spouse could well take it very personally. He or she could try to cause trouble in your Chapter 13 case, and possibly even attempt to take you back to divorce court. Often there's not much your ex-spouse could actually accomplish, but any unreasonable adversary can make your case proceed less smoothly. So this is something we need to consider with you. 3) In a Chapter 13 case you must complete your case in order to discharge these debts. That includes these non-support debts to your ex-spouse. Be very clear about that before you start a Chapter 13 case. Consider carefully whether you will be able to complete the payment plan. If you have a significant amount of non-support debt from your divorce, Chapter 13 may be a better option than Chapter 7. But this is a delicate decision that needs to be discussed carefully with your attorney.